Your card is beautiful! :-) p.s I love Stamping Destroyed My Life - it's hilarious! WOW, your card is amazing. Love all the details you added with the die cuts. Seriously, Joan ... so pretty! Wishing I could play a few hundred times with those Folk Heart dies! Absolutely gorgeous! I think I may need to pull that stamp set out today and use it. You've inspired me. Truly beautiful, Joan! I love that you embedded the flower right into the heart and your "painting" is beautiful! Yet another lovely card Joan. Very nice. thanks for the questions Julia! I will do a post on this soon. It is a beauty! Lots to it for inspiration. Absolutely gorgeous card you made, too! Love the flower inset and popped out. SUPER card Joan!! Congrats on the gig over at Ellen's Classroom! Oh my word, this card is just beyond gorgeous, I gasped when I first saw it! I will! Thanks for asking and for your kind comments! Soft, elegant and ever so pretty Joan!! This is beautiful Joan! Perfect in fact! I feel inspired! PINNED! Absolutely love this - so creative. 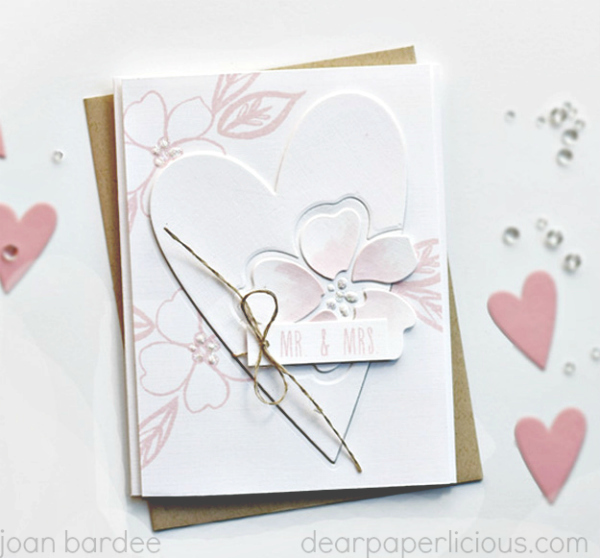 Soft, feminine, beautiful card! wow! This is fabulous Joan! I love it! Gorgeous work!